The Montepulciano variety cultivated in the Abruzzi stems from Greek or Balkan origins, given its complex morphological characteristics and its vigour. It became widespread in pre-Roman times, when it made its home in the Peligna Valley between the villages of Raiano and Sulmona. The area was colonized by the Paeligni who came from Asia Minor or Illyria around the 12th century BC.. 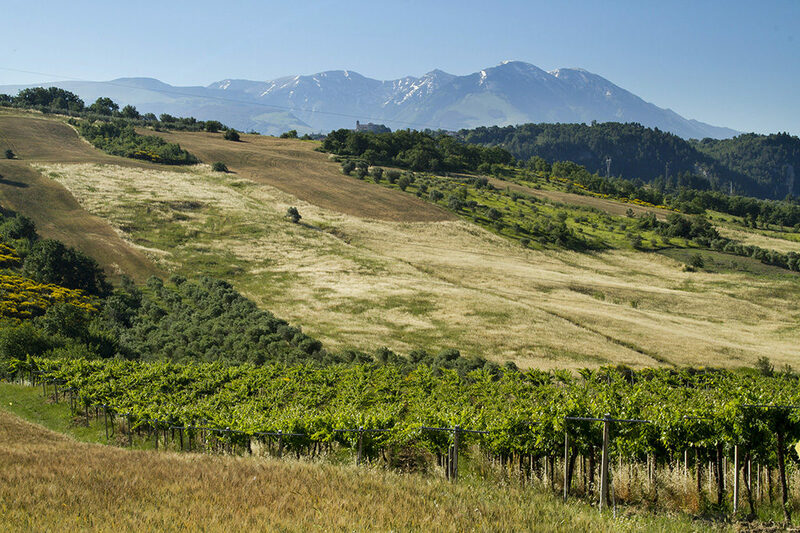 The Binomio vineyard is located in the heart of this area, just a few kilometres east in the Pescara valley, on the slopes of the Majella massif. It positively benefits from the cool winds coming from the Peligna Valley. The grapes cultivated originate from 40 year-old vines and belong to an old Montepulciano bio-type variety nowadays defined as the “Africa-Binomio clone” that produces short-tailed bunches with small berries which resemble the shape of the African continent. The name Cerasuolo originates from cerasa (or cirasce, in Abruzzi dialect),meaning cherry. This name was attributed to the colour, “cherry red” , which this wine made from Montepulciano grapes traditionally had . Starting from a selection of the Binomio vineyard, Cerasuolo d’Abruzzo Superiore is macerated for two days and fermented without skins in second/third-use barriques. Matured and refined for about 6 months on the lees with “batonnage” it’s then racked into steel vats and left on its fine lees for a further 4 months. It is filtered and bottled in the summer. From its character it could actually be considered, as a reserve wine. In fact, it is released some months later respect to other wines of the same appellation. The colour is pomegranate with red cherry hues. Aromatically exuberant on the nose, with a hint of raspberry, pomegranate and red currants. The wine is expansive, creamy and long-lasting on the palate with a long aftertaste. It matches fish soups, bucatini all’amatriciana, agnello a scottadito, handcrafted charcuterie and Cambodian fish amok. Binomio Cerasuolo Superiore is a complex, powerful yet fresh rosé wine, inspired by the most well-known Bandols, that can age and evolve in the bottle for years. It unites the drinkability and pleasant features of a rosé wine together with length, creaminess and satisfaction.